The Napa Valley has so much to offer! Most people plan a trip because of the vineyards, but there are many other tourist draws, including the Calistoga mud baths. I had never experienced a mud bath before, but it seemed to be popular and so I thought why not? Plus, it would be a great break from wineries because I can only go to so many wineries before becoming intoxicated – tasting and spitting the wine just isn’t fun for me! So, my friend, Leigh-Anne, and I decided that we would try the mud bath at Dr. Wilkinson’s in Calistoga. Let me tell you about our experience with Dr. Wilkinson’s mud bath and resort, so you can know what to expect. We enjoyed our mud bath experience at Dr. Wilkinson’s Hot Springs Resort. 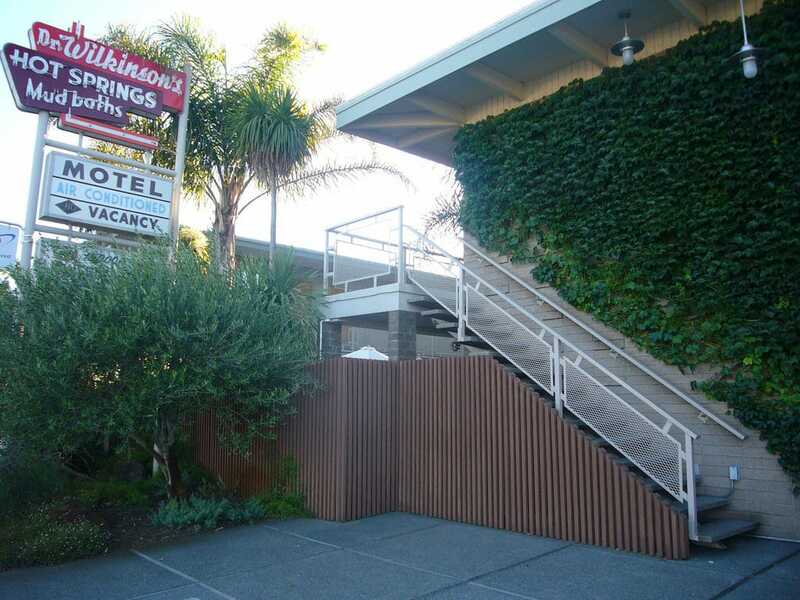 Dr. Wilkinson’s Calistoga Hot Springs Resort has been serving customers for over 65 years! Although both founders John “Doc” and Eddy Wilkinson have passed away, their children have been co-managing the “resort” for the last 35 years. They do the best mud baths in Napa Valley. It’s a combination of Calistoga’s pure volcanic ash, spring water, and Canadian peat. The volcanic ash cleanses and smooths your skin, the peat buoys you up and allows the mineral water’s soothing heat to penetrate more deeply. We drove into Calistoga that morning, about a two and a half hour drive north of San Francisco, and arrived a few minutes before our appointments. Generally, I like to arrive for a spa treatment a bit ahead of schedule so I can relax in the pre-treatment room, but at Dr. Wilkinson’s, there is no pre-treatment room so you should arrive just in time to change clothes. Also, they do not have locking lockers, so you check your purse and jewelry with the front desk. Everything went fine for us, but this is something that you should keep in mind. Next, men and women are separated and they take you to a changing area, where you will put on a robe. There are cabinets to store your clothes. For the mud bath, you will be naked, so there is no room for modesty at Dr. Wilkinson’s – so another thing to keep in mind. We then were led back to the mud treatment area, which was separated from the rest of the facility by a glass door. Once we were led in, I understood why – the mud has a “special” scent to it. It smells the way it looks, and it looks like a trough of manure. As we walked in a woman was using a large shovel to move the mud. I believe that this is the sanitation method for the mud since they do not change out the mud between guests. We found out once we were in the mud bath that there are pockets that are very warm, typically toward the bottom of the container. The mud can be very hot, but the attendants are nearby in case you need anything and can add cold water or move the mud if something doesn’t seem right. Before getting into the mud treatment, we had to shower. Then, you carefully slide from the side of the bath and into the mud – the goal being to not sink too far into the mud. Once in the tub, I was on top of the mud and my attendant had to pat the mud on top of my body so that I was covered by mud. Then, a mask (fortunately made of a different substance) was applied to my face and cucumbers and a wet towel were placed over my eyes. I was in this position for ten minutes. I enjoyed the feeling of being suspended in the mud, but the smell was still a bit powerful. After the mud treatment, there was another shower and then I was taken to a mineral whirlpool bath. I actually quite enjoyed this ten-minute treatment – although the tub was a bit short for my 5’ 8” frame. Then, I was taken into the steam room. It was a small room, but I got to catch up with Leigh-Anne on the mud bath experience. We had been in the mud baths right next to each other, but I hadn’t wanted to distract her in case she had been relaxing during the treatment. We briefly chatted and then it was off to the blanket wrap. I nicknamed this the cocoon treatment because I was wrapped like a cocoon and then left to relax, and it actually was quite relaxing! After about 15 minutes there, I was taken to a room for my hour-long massage. My masseuse applied hard pressure and focused on my neck and back just as I had requested. After the massage, the treatment had concluded. The total treatment was a little under two hours. I had booked a room at the Dr. Wilkinson’s Hot Springs Resort hotel because the location was in the heart of Calistoga. 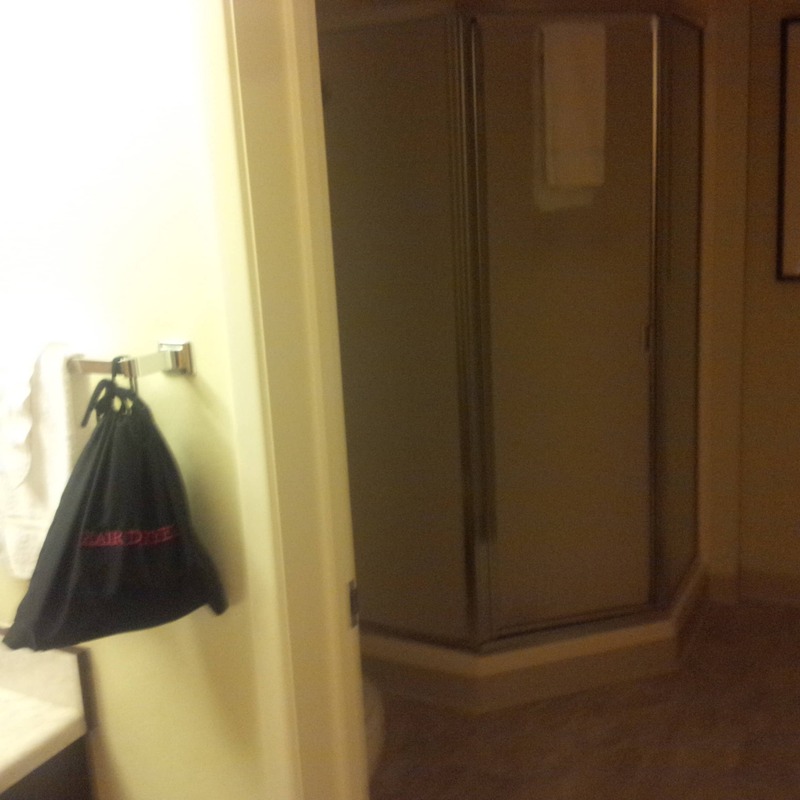 Given that the hotel has a “historic sign” and the bath house was a bit dated, I was not sure what to expect. 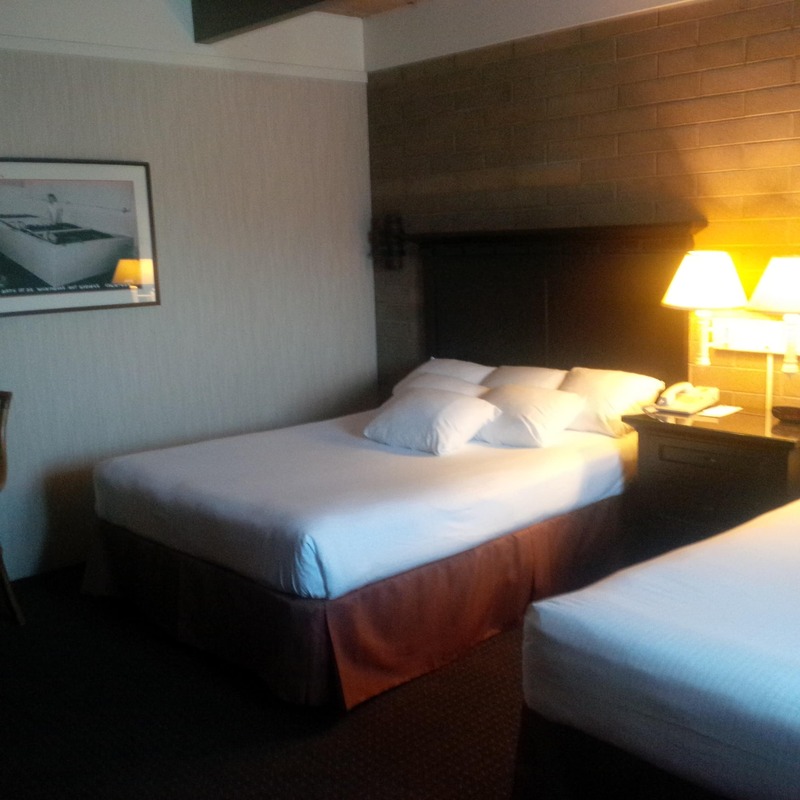 I was pleasantly surprised with our room and the bed was great. We also had the opportunity to use the indoor jet pool which was a nice, relaxing way to end the day. It is open until 10 pm nightly, and per the sign we saw, accommodates 38 people. There also are two outdoor pools. You can read more reviews on Tripadvisor here. The beds in our room at Dr. Wilkinson’s Resort. The bathroom in our room at Dr. Wilkinson’s Resort. We had a relaxing dinner at Evangeline which was a few short blocks from Dr. Wilkinson’s. Some folks sitting next to us at the W H Smith Winery recommended it. They also mentioned that there is no corkage fee on the first bottle of wine you bring, and it is $15 on each additional bottle. We were definitely able to save some money as we purchased a bottle from W H Smith and brought it to the restaurant. The restaurant serves French food with a creole twist. We originally had reservations after 8 pm, but as we were walking around Calistoga a little before 6 pm we were famished. We decided to stop by and see if they had any earlier availability. The indoor area of the restaurant is quite small, so we ate on the outdoor patio as there was availability at the earlier time. They had heaters, and we just kept our jackets on. Evangeline had some daily specials and we decided to start with one of them – the crab and artichoke dip. It did not disappoint. Also, we had fried pickles that were equally delicious! We also each had an appetizer, a main course and then we shared a dessert. I am always a sucker for beef tartar, and this was some of the best that I have had! I would definitely recommend this restaurant. Overall, it was a very relaxing and satisfying day. I enjoyed my mud bath in Calistoga. Have you ever had a mud bath? We would love to hear about your experience in the comments. Be aware that there is no room for modesty at Dr. Wilkinson’s. If the mud seems hot, ask them to adjust it – you can get burned by it. Do not try to do Dr. Wilkinson’s mud bath after a day full of wine tastings. It is best to be well-hydrated and sober. Check out our post about things to do in Napa besides wine tasting if you are looking for more ideas. I didn’t realize we have a mud bath at Calistoga. Maybe I should try it, although my early childhood memories about mud baths are pretty grim. My grandmother used to “paint” us with smelly mud and we hated it. Thanks for the tips. It wouldn’t even have crossed my mind to go there inebriated. Ha, ha, ha! Anda – That’s too funny! Yes, you should try it and then we would love to hear what you think about it. Thanks for stopping by! What a great alternative to wine tasting. I have to admit I was on the trails the entire time I was in Napa, but maybe next time I will check this out. Kacy – Yes, it is easy to get caught up in the wine tasting in Napa (more tips on that in our next post), so glad we could provide another idea. Thanks for stopping by. Yes! A glorious mud bath at Glen Ivy Hot Springs with my toddler and I plan to return. It’s near Temecula in Southern California. Wine tasting nearby too. Perhaps there’s a correlation! Thank you Elaine. We will have to try that. The closest we have come to a mud bath thus far has been swimming in the Dead Sea and Gellert’s thermal baths in Budapest. I’m going to pin this one for later, though. We do plan to visit California at some point. Linda – Thanks for stopping by and yes hopefully you can visit at some point. I also hope to do the Dead Sea someday.